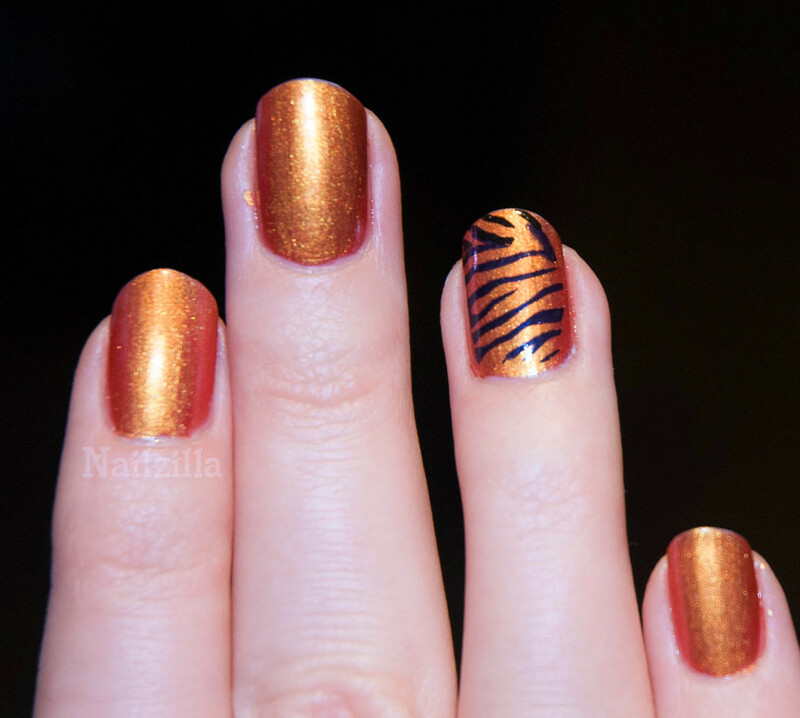 NailZilla: Nubar Sun Gold tiger time! 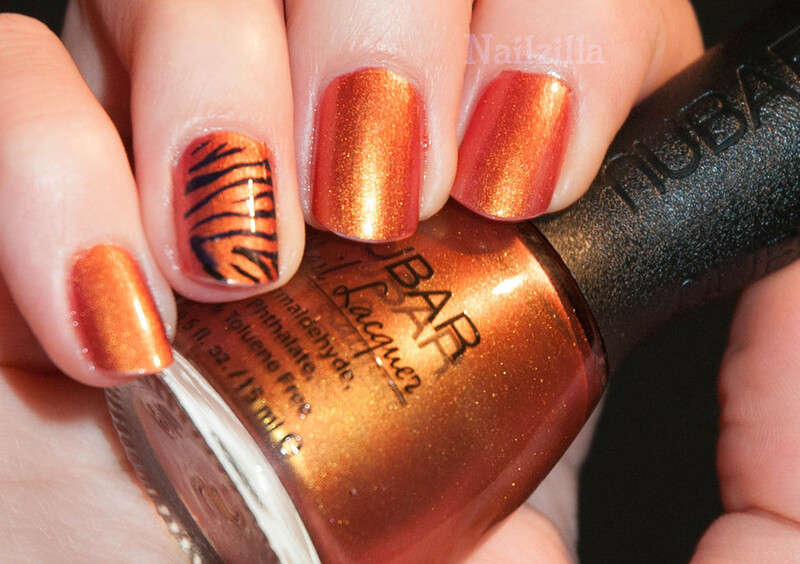 Nubar Sun Gold tiger time! Oh now I missed you, tiger/zebra stamp! 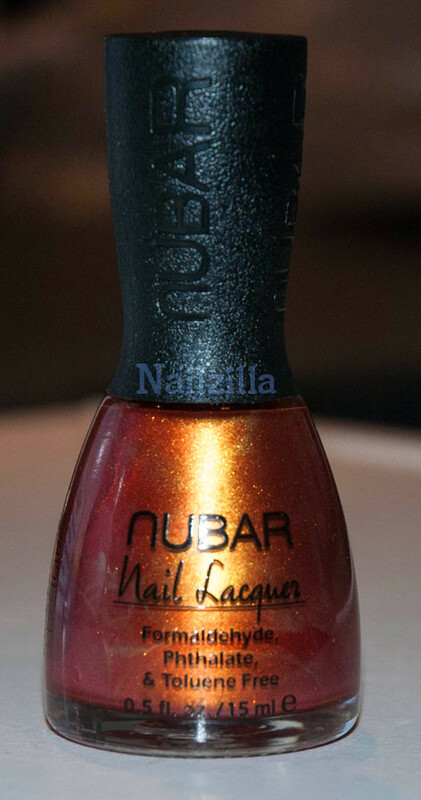 Presenting Nubar Sun Gold - an orange to red polish that glows like the sun itself. The polish texture was great and it wore very well - the only downside is that I did not see too much color shift, but it was still a wonderfully fiery color. I wouldn't really call this one a duochrome, maybe an orange metallic with a golden shimmer? At least that's what it looks like to me. It was listed as a duochrome among other Nubars, like Indigo Illusion but I am not convinced. See? Even in the bottle it's not really shifting, colors but you can see the golden shimmer inside. Still a nice polish, just not a true duochrome. I just discovered your blog and I imeditely fell ofr it's semplicity and for you cute avatar. I adore your nail arts, the are so cute and romantic! I also can defently relate to your love for brands from all over, since I am a traveller. I've subscribed gladly and will come back & I'd really appreciate if you'd care to take a look to my blog, maybe subscribe. We are an amazing little group of very bond friends from everywhere, and I'd like to add someone to our shaing moments! :) Cheers!